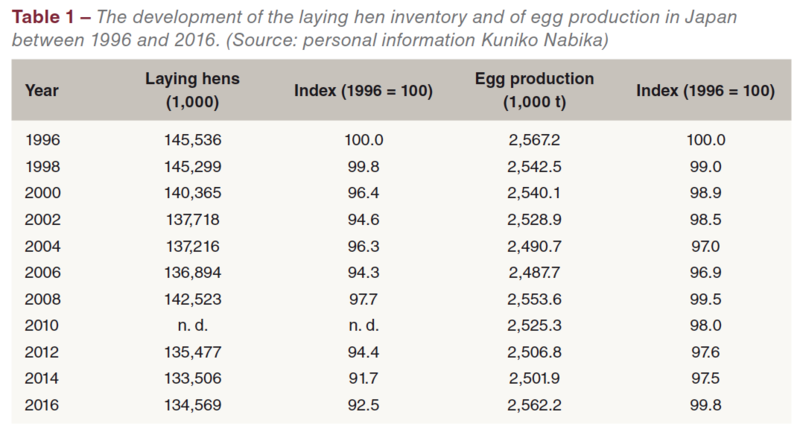 In contrast to the considerable dynamics of the egg industry in China and India, egg production in Japan has remained almost unchanged between 1996 and 2016; the laying hen inventory even decreased by 7.5% in that time period (Table 1). While China and India belong to the Threshold Countries (also Newly Industrialised Countries) which over the past decades showed a remarkable development not only in manufacturing but also in animal production, Japan is an Old Industrialised Country with an economic standard similar or even higher than in Europe and North America. Between 1996 and 2014, the laying hen inventory declined by 12 mill. birds or 8.3% before increasing again. 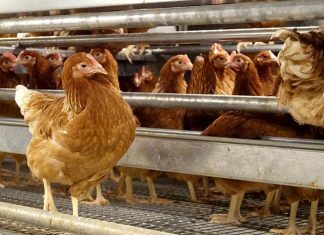 But even in 2016, the number of laying hens was about 11 mill. lower than in 1996. A sharp decline can be observed in the first half of the last decade. It has to be seen in relation to AI outbreaks in 2003 after decades of no infections (Sims et al. 2005). The outbreaks had also impacts on egg production. 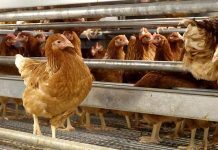 It is worth noting that despite a decrease of the laying hen inventory by 7.5% between 1996 and 2016, egg production only fell by 0.2%. This indicates that production systems became more efficient. The use of layers with high laying rates and high density feed as well as modern housing systems and a very efficient veterinary service were the main steering factors behind the different dynamics. 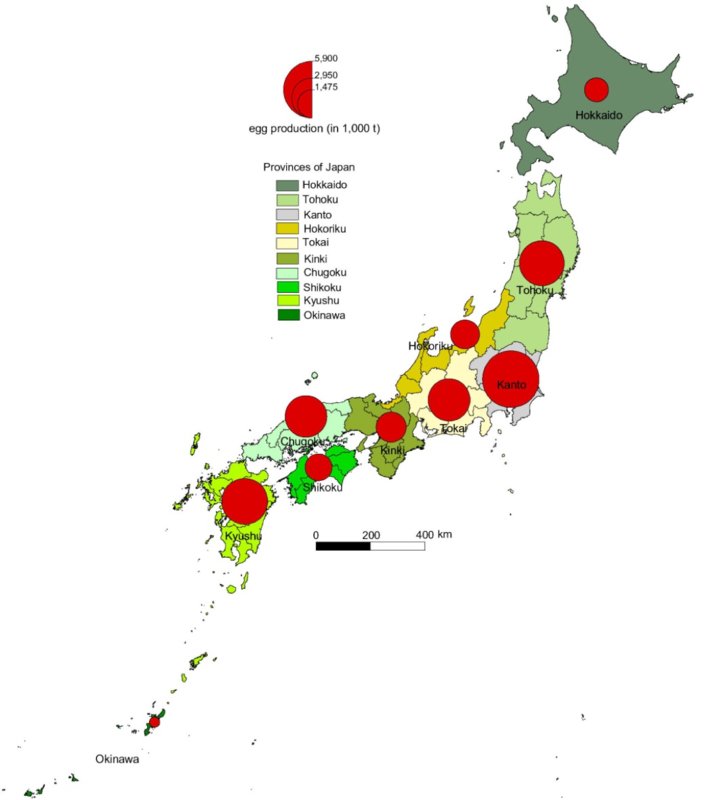 Laying hens and egg production (Figure 1) are not evenly distributed in Japan. 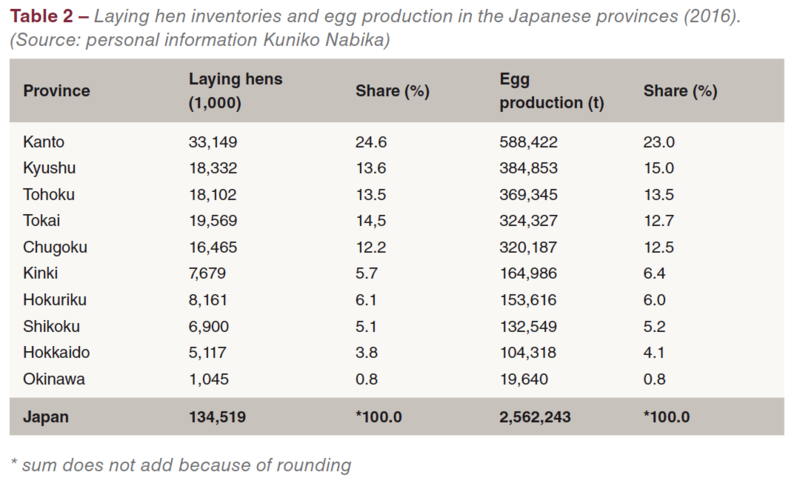 Table 2 lists the Japanese provinces according to their contribution to the laying hen inventories and egg production. 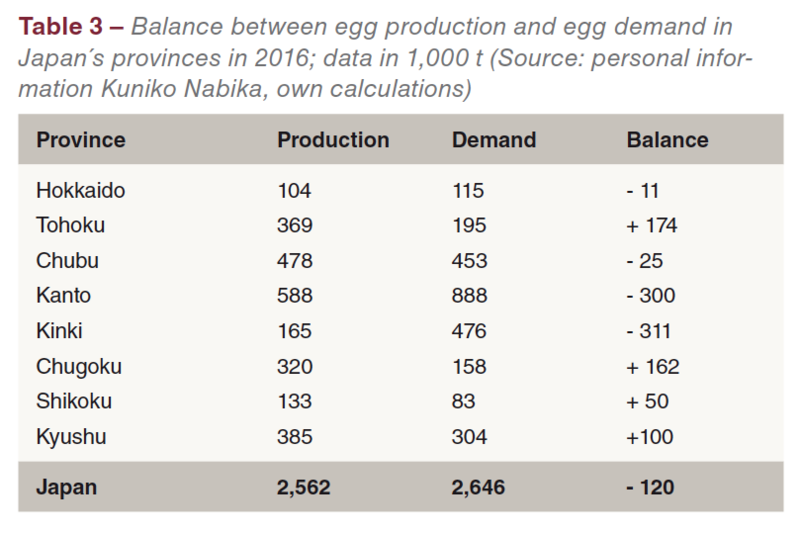 The three leading provinces shared 51.5 % of Japan’s egg production and 51.7% of the laying hen inventory. A comparison of the contribution of the provinces to the laying hen inventory and to egg production shows some differences. Obviously the laying rates differ between the provinces. In Table 3, the balance between production and demand at province level is documented. In 2016, the provinces Kinki and Kanto had the highest deficit with over 300,000 t each; the highest surplus had Tohoku with 174,000 t and Chugoku with 162,000 t. The balance was calculated on the basis of the population in the provinces and an average per capita consumption of 331 eggs. In contrast to China and India, egg distribution in Japan resembles that in Europe or North America. The large companies are marketing the branded eggs directly to the big food retailers. The price, they receive, is either based on the “cost-plus-system”, whereby the price is calculated on the production cost plus a pre-determined margin, or directly based on the market price. 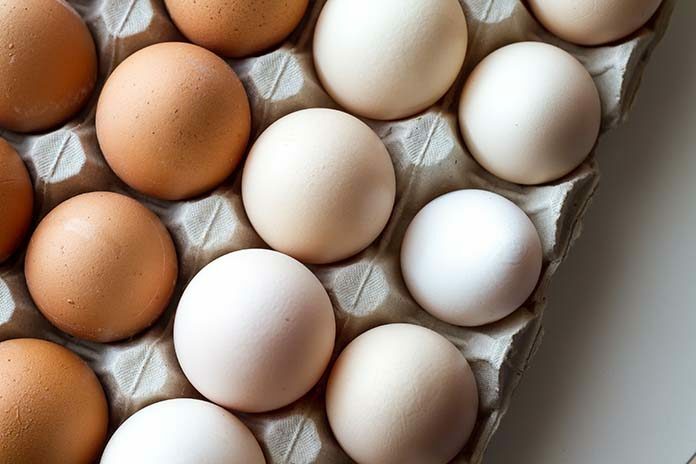 Smaller egg producers sell their eggs through major distributors which play a decisive role in determining the egg price. These eggs are in most cases not sold under a brand. As could be shown in the preceding papers, the egg industry in Japan differs considerably from that in China and India. Market oriented companies are dominating (Table 4). They are organised similar to egg companies in Europe or the Americas. ISE Foods, Inc., the largest company with 13.6 mill. 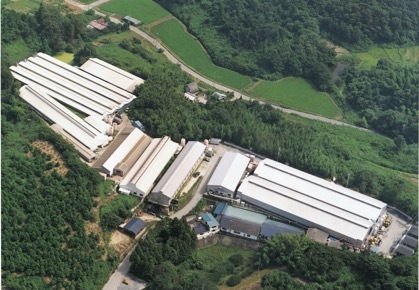 layers in Japan, started as a breeding company in 2012 and grew continuously to the present size. It is vertically integrated from breeding to egg processing. Besides several locations in Japan, ISE is also active in the United States, Singapore and China and is planning a large egg operation in India. The second largest company, Akita Co., Ltd., owns about 10 mill. layers at several locations in Japan. It is also vertically integrated and besides eggs produces vaccines and pharmaceuticals for the Japanese egg industry. The ten leading companies had an inventory of together 44 mill. laying hens which equaled 32.7% of the total number of laying hens in Japan. The sectoral concentration is this country is one of the highest worldwide. Egg production in Japan is known for its high quality and hygiene standards, which sometimes make it difficult for exporting countries to get a foot into the Japanese market. Japan is not able to meet the demand by domestic production. 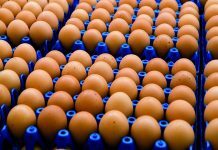 The self- sufficiency rate has been very constant over the past years with 95% to 96%, resulting in an annual import volume of almost 25,000 t.
In 2016, almost 3,000 t of shell eggs and 21,820 t of egg products were imported. In Table 5, the countries of origin for the imports are documented. Shell eggs for consumption were mainly imported from Brazil, China and Taiwan, egg products from many more countries. The USA, the Netherlands, Italy, China, Thailand and India were the leading countries of origin. The USA and Brazil shared 45.6% of the total import volume in 2016. Despite the undersupply with eggs, Japan is also an egg exporting country. 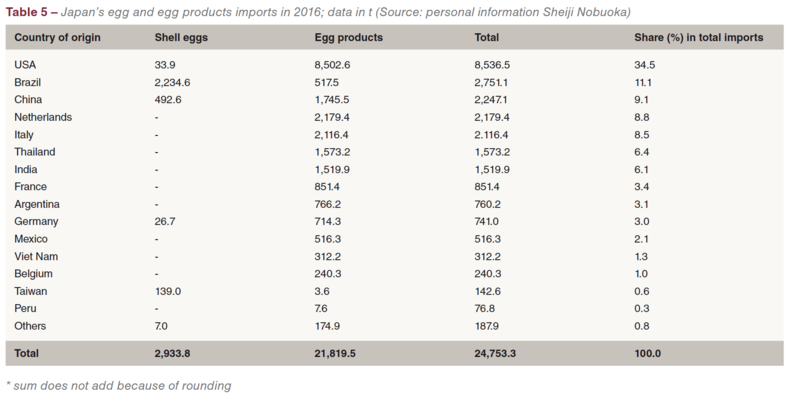 In 2016, Japan exported almost 3,400 t of shell eggs. Hong Kong alone shared 97.5% of the export volume. It can be expected that the Japanese egg industry will not grow very much in the coming years. A slowly decreasing population and the already high per capita consumption will result in a decreasing egg demand. The shortage of land areas for feed production and the construction of large egg operations (Photo 1) will also add to the stagnation of the industry. The activity of ISE Foods, Ltd. outside Japan is a good indicator for the fact that a further domestic growth is not necessary. International Egg Commission (ed. ): Annual Review 2017, London 2017. Sims, L. D. et al. : Origin and evolution of highly pathogenic H5N1avian influenza in Asia. In: Veterinary Record 157 (2005), p. 159-164. 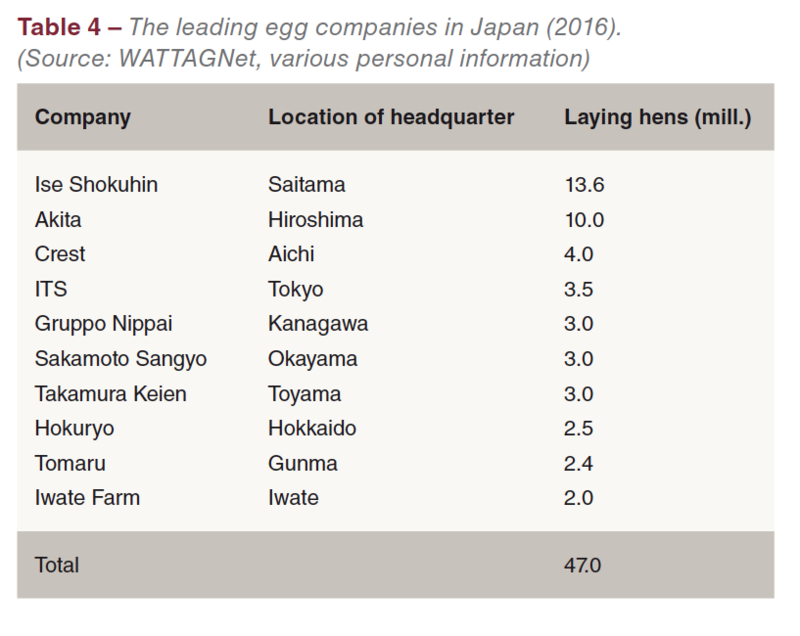 WATTAgNet: Top 25 global egg producers. www.wattagnet.com/articles/20682-who-are-the-world-s-largest-egg-producers. (accessed February 27th, 2018). 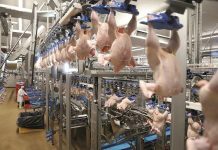 Windhorst, H.-W.: The globalisation of egg and poultry meat production. London: International Egg Commission, September 2017.